Say, you’re creating a new startup. What’s one of the most important things you need badly? Money. But how do you convince someone to give you some cash? An elevator pitch. You need to think hard and produce 2-3 (not 20-30!) sentences that clearly explain what’s your product is about and why it’s better than tons of similar others. This elevator pitch technique of being brief and up to the point is extremely important even if you’re not in the startup business. You always sell something even if there is no money involved. Let me stop beating around the bush. Still have no clue after reading all this text? I don’t blame you. These guys created a great library, but they didn’t bother to sell it to you. It’s free – why bother selling, right? Wrong! If you like your product, spend some time trying to come up with an elevator pitch. 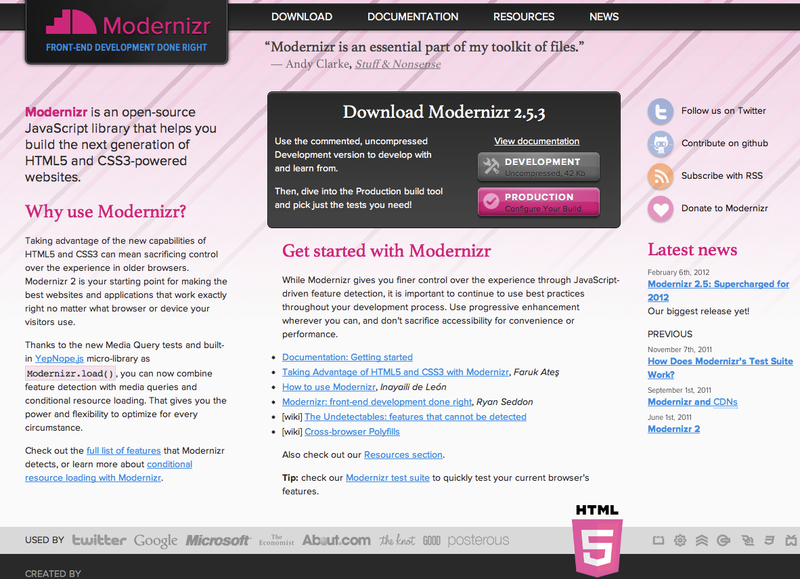 Have you read the section “Why use Modernizr?” Was it convincing enough? Do you feel the need to start using it? Actually, there are two important words buried in there: “feature detection”. This is it. This is the holly grail. Having said that, I want to take my hat off to the creators of this little gem Modernizr.